This is really just a simple salad that is topped with some lovingly prepared figs. 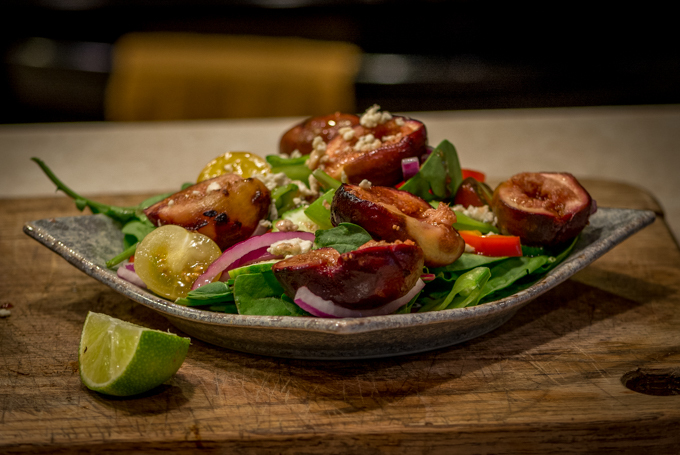 The figs are marinaded and then baked in a fluid that will, after it is reduced, become the dressing for the salad. This simple, sweet and sour glaze sets off the intense rich flavor of the baked figs. We typically top this type of salad with either some really sharp blue cheese or Gorgonzola. Almonds provide a great addition, particularly if you take the time to dress them with salt, oil and dried rosemary. I hate to write and dash, but there is really not much to say about this one. One piece of advice is to use cast iron to bake the figs; you will get a little bit of char and caramelization…perfect. Also make sure to reserve the liquid at each step (marinade, then bake) so that you can reduce it into a lovely glaze later on. In order to reduce the liquid, transfer it to a sauce pan and boil the crap out of it. When it starts to thicken, remove it from heat, transfer it to another bowl and let it cool. No sense in wilting your lovely salad by being hasty. Well, there is one last piece of guidance I can provide; cook this, then eat it…it’s really, really good. In a small bowl, combine vinegar, honey, and salt. Pour over halved figs and set aside to marinade for 15 to 20 minutes. Coat medium cast iron skillet with the olive oil and place figs, cut side down, in bottom. Pour marinade over figs and bake in a 425 degree F oven for 8 to 12 minutes. Remove figs from skillet and allow to cool. Reduce marinade fluid over high heat until it forms a thin syrup. Set aside to cool so it can be used as a dressing. Using remaining ingredients, prepare individual salads and arrange figs on top. Drizzle with thickened marinade and garnish with almond and Gornonzola. Up until yesterday, I had never cooked a fish tart…but I knew deep down inside that I needed to. The base idea for this one came from Savory Baking by Mary Cech. As I write this post, this book is listed for some ridiculously low price on Amazon. Not sure what the deal is, but it a great book for those that like baking things that are not necessarily sweet. Oh well, sometimes even good books get discontinued. Anyway, with some adjustment of ingredients and spicing scheme, I ended up with something that was truly memorable. The tarragon and dill really shine against the curry, and, surprising, the crushed black pepper is pronounced without being overwhelming. 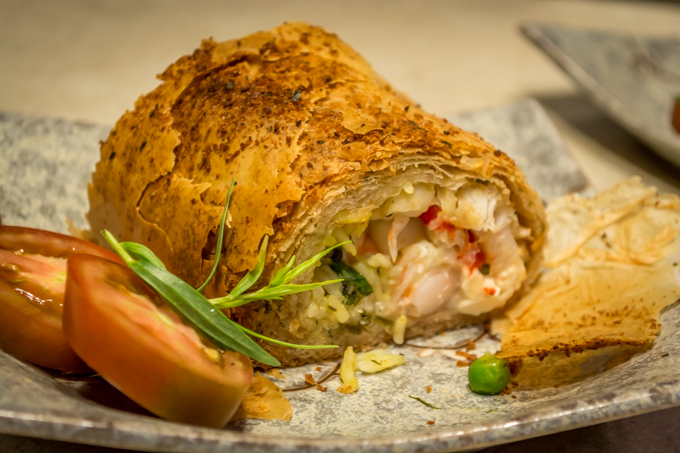 The roast red pepper provides a little bit of interest and the lemon zest provides a great balance to cut through the staggering amount of butter that is used to assemble the phyllo. Definitely a huge win for a first effort and not one that a would change too much…. One of the better things about summer and early fall in the Pacific Northwest is that this is the time that grape leaves finally get big enough to use in cooking. That means that it is time to make dolmas …or at least my version of it. And if you have your own particular version of this dish, you are not alone. As it turns out, the idea of stuffing grapes leaves with various spices, dried fruits, grains, and meats is wildly popular. 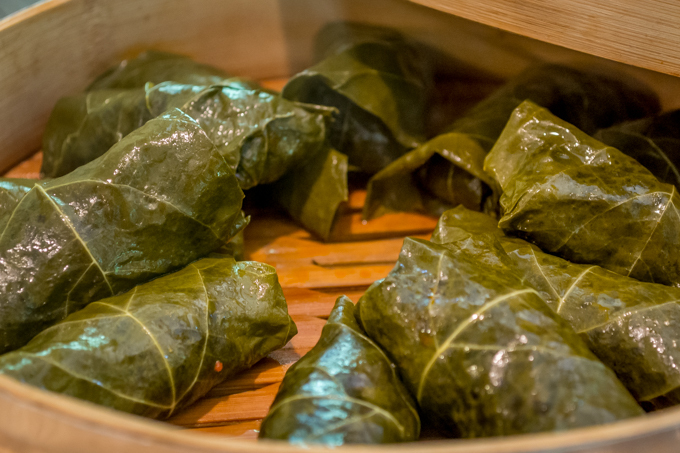 Although the term is Turkish in origin and also refers to hollowed out and stuffed vegetables, stuffed vine leaves fall under the umbrella term. I make mine with lamb, dried cherries, and rice and spice them pretty conservatively with allspice, cinnamon, and paprika. Tomato and lemon juice are there to sharpen the flavors somewhat and mint provides a nice aromatic touch. Although dolmas are commonly baked as a casserole, I prefer mine steamed so that the texture is firmer….